Discussion in 'MacBook Pro' started by nmaxcom, Aug 29, 2014. I bought a MBP 128GB a few weeks ago. I should have bough it with at least 256GB but I thought it would be enough. What's the best way to get bigger storage? I've looked through all kinds of solutions, but not sure what's best. I'm afraid of disabling my warranty by changing the internal drive, and I also wouldn't like to have to carry yet another external thing around. I've seen one solution is to use the SD card slot. Would you recommend it? How big can storage be in one of those? How fast is it? If you have the new Retina model the internal drive is replaceable, but nobody makes one yet. Both OWC and Transcend have said they are working on it. Replacing your drive will not void your warranty unless of course you break something while you are in there. An external drive like you mentioned will work fine. Give this thread a look for info about a 128GB Transcend SD card that might be a good solution for you. 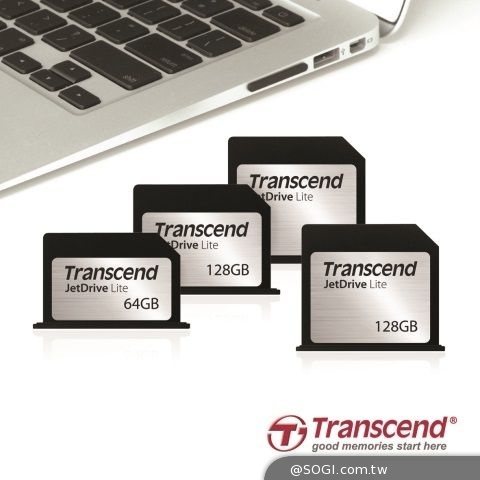 Transcend makes the JetDrive Lite for MacBooks. Pretty handy for media storage and they make one to match most MacBook models. There are several threads about (almost) flush-fitting SD cards for MacBook Pros/Airs. Any of these will do well at adding storage. But understand this is still an "external" drive. And depending on your machine, some SD card slots are connected via the USB bus and others via the PCIe bus. The PCIe bus is much faster for read/write. So what is the storage requirement? How much data do you have to have with you....as opposed to all the data you own? Without knowing the target....hard to hit it. The "best" way would be to buy another machine and get more storage this time. But the "next-best" way would be to work off of as fast a drive as possible which seems to me, to be a toss up between the thunderbolt drives and the USB 3.0 drives. I know the touted specs, but real world usage of the 3.0 seems to really give the Thunderbolt a run for its money. An 11gb transfer to my rMBP was actuall 10% faster with my 3.0. Not that much really, an extra 128GB would be enough. The "best" way would be to buy another machine and get more storage this time. Why do you think that would be the best way? Short answer: The only replacement SSDs for the new MacBook Pro are ones that people took out from higher models. Although the SSD is not soldered , replacement parts are very hard to find since Apple tells manufacturers to make a propriety interface so to speak. Also , SSD replacement is not covered by warranty if you do it since Apple believes you shouldn't upgrade your own computer by yourself. in the context of the thread. Is it largest, fastest, cheapest....? I would get a 128 GB USB 3.0 drive and keep it on a keychain. Just be sure to backup important stuff you store on it because USB flash storage is usually poor quality. Doesn't work for late-2013/mid-2014 ones, which the OP has. *nods* That said aren't they tryingto come up with a replacement solution for this generation of hard drives? OWC is attempting to. But it'll be some time before it makes it to the market. I have a late 2013 MBP and it fits like a charm in the SDXC slot. Ohh I thought you meant the JetDrive mSATA SSD. Because "BEST" is a totally subjective term to use. Is your storage simply capacity related or workflow related? Did you buy it less than 14 days ago? If so I'd return it and buy one with larger capacity. He stated a few weeks, so the chances are high that he's already beyond the 14 day return period. Still being so new, go to your apple store and see if you effect an exchange - it can't hurt to ask. The question is how you define in the context of the thread. Is it largest, fastest, cheapest....? The order would be fastest, cheapest, largest. To me the transcent way seems a better overall deal. Don't you? Oh alright, I thought you meant the 960GB Transcend JetDrive mSATA blade SSD, not the JetDrive Lite SDXC card.